Add H4K12ac monoclonal antibody - Classic (sample size) to my shopping cart. 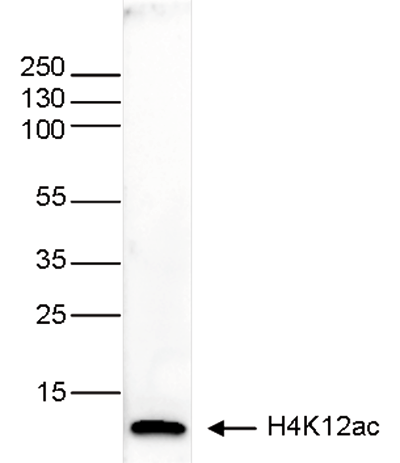 Request a quote for a bulk order for H4K12ac monoclonal antibody - Classic (sample size). Please fill out the form here below. Your local sales account manager will get in touch with you shortly and send you a quotation based on your requirements. Monoclonal antibody raised in mouse against histone H4, aceylated at lysine 16 (H4K16ac), using a KLHconjugated synthetic peptide. 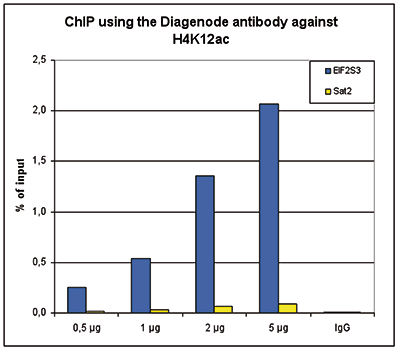 Diagenode strongly recommends using this:	H4K12ac monoclonal antibody - Classic (sample size) (Diagenode Cat# C15200218-10 Lot# 001-11). Click here to copy to clipboard.